Now on the banks of the Boyne, opposite Rosnaree, there stands a tumulus, said to be the greatest in Europe. It covers acres of ground, being of proportionate height. The earth is confined by a compact stone wall about twelve feet high. The central chamber, made of huge irregular pebbles, is about twenty feet from ground to roof, communicating with the outer air by a flagged passage. Immense pebbles, drawn from the County of Antrim, stand around it, each of which, even to move at all, would require the labour of many men, assisted with mechanical appliances. It is, of course, impossible to make an accurate estimate of the expenditure of labour necessary for the construction of such a work, but it would seem to me to require thousands of men working for years. Above is an audio file of my interview with Sean Moncrieff on Newstalk radio last Friday, December 2st - the winter solstice. The interview lasts almost ten minutes. "The circumstances which struck me most in the common Irish were, vivacity and a great and eloquent volubility of speech; one would think they could take snuff and talk without tiring till doomsday. They are infinitely more cheerful and lively than anything we commonly see in England, having nothing of that incivility of sullen silence with which so many Englishmen seem to wrap themselves up, as if retiring within their own importance." Labels: A Tour in Ireland 1776-1779, Arthur Young, quote. 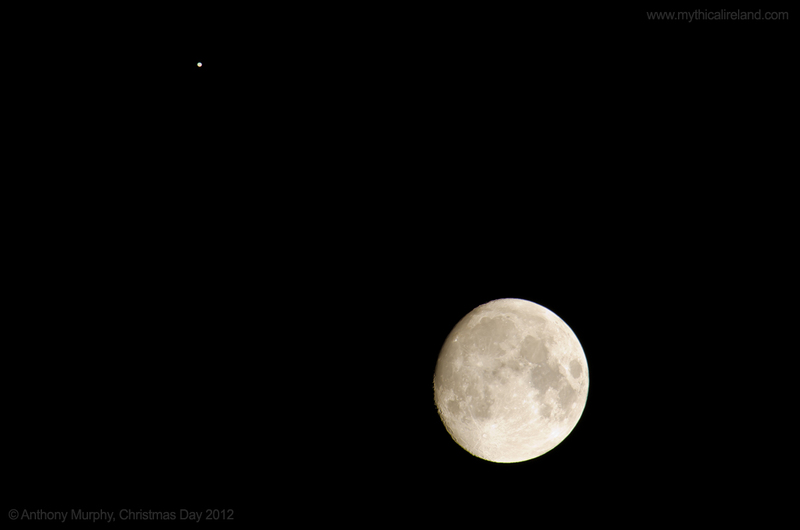 A lovely conjunction of the almost full moon and the bright planet Jupiter shining brightly in the night sky over Ireland on Christmas Day, December 25th, 2012. The pair are located above the head of Taurus and make quite a sight, being only a degree or so apart. Labels: Christmas star, conjunction, Jupiter, moon, Taurus. Crowds gathering for the solstice dawn at Newgrange. The sun didn't appear. The sun didn't show at Newgrange this morning for Winter Solstice, but that didn't deter a huge crowd from enjoying the occasion. A larger-than-usual gathering, perhaps helped by all of the recent hype about the supposed end of the world, came together at the 5,200-year-old Stone Age monument to enjoy the spectacle nonetheless. There was music, drumming and reading, including a brief presentation by myself. I read from George Russell's "A Dream of Angus Oge" and Joseph Campbell's Masks of the Gods before giving a brief explanation of the cosmic significance of the solstice and how that fits in with the design and mythology of Newgrange. The huge crowds at Newgrange enjoyed the morning despite the sun not shining. Music was provided to greet the 2012 solstice dawn. 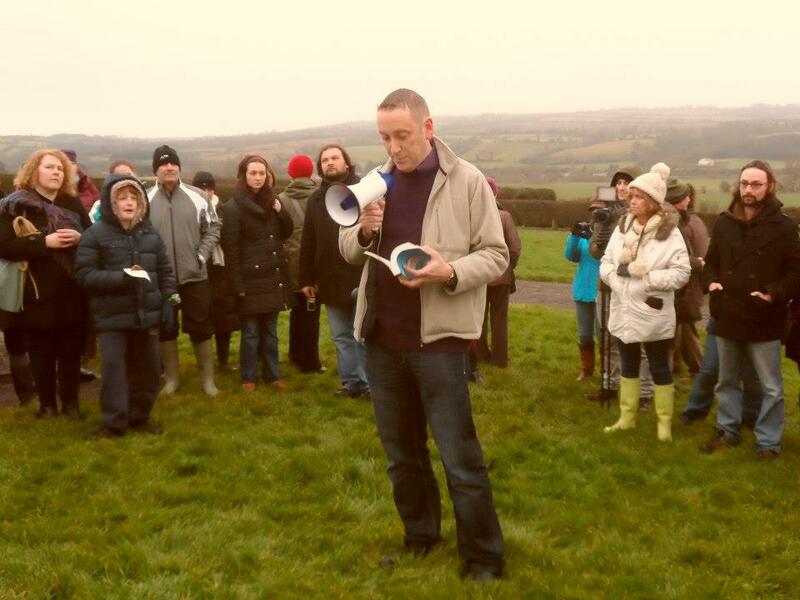 Yours truly reading from Joseph Campbell at Newgrange. Just some food for thought. 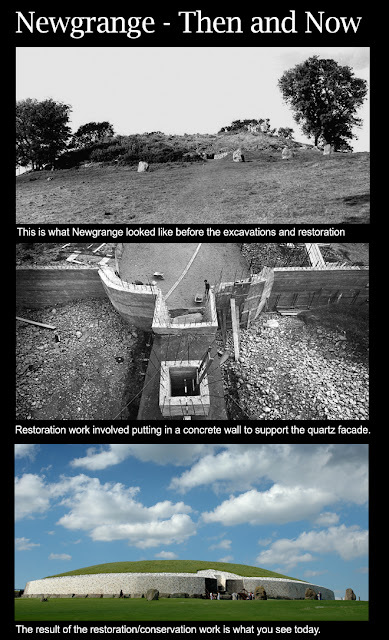 These photos show Newgrange before, during and after the restoration/conservation work which took place during the archaeological excavation of the mound in the 1960s and 1970s. On top is a picture of the monument as it appeared before the archaeological work. The second picture shows the giant concrete wall which was added to the front of the mound. The main purposes of this wall are to prevent cairn slippage out over the kerbstones, which had happened previously in the Bronze Age, and to securely fasten the white quartz and granite cobble stones which form the modern facade. These stones were found to be on the ground, beneath the cairn slip material. The archaeologist deduced from experimentation that the quartz had to have been placed on the front of the mound in order to have ended up underneath the cairn slip material. Interestingly, some kerbstones had fallen over as a result of the cairn slippage. There was no quartz underneath the stones that had fallen over! shaped Cygnus, as well as Lyra. 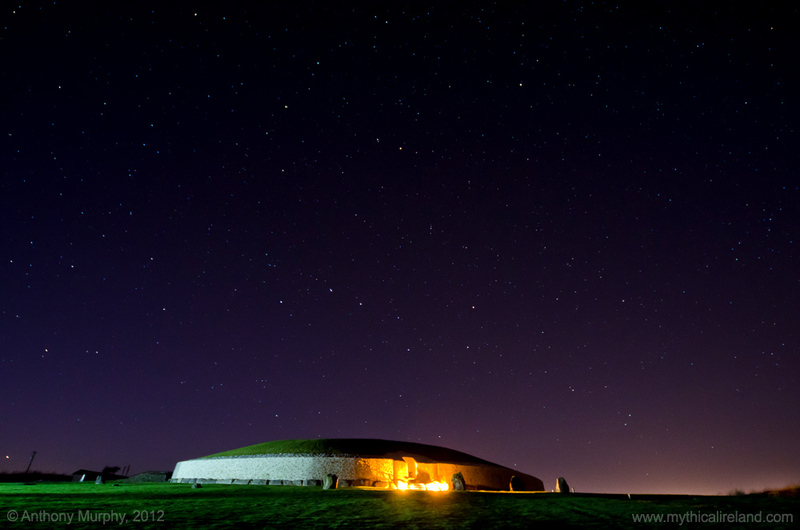 A star-filled November sky over Newgrange. Above are three images of Newgrange I took this evening, Saturday, November 17th, in the afterglow after the sun had gone down. It was very cold out there this evening, but that did not take from the spectacular beauty of the sky. The crescent moon hung low in the southwest near the Milky Way, beneath Aquila, the Eagle. 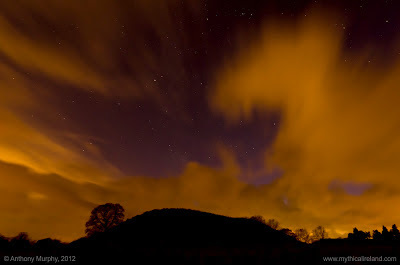 Some nicely timed clouds made a nice flourish in the first two images. 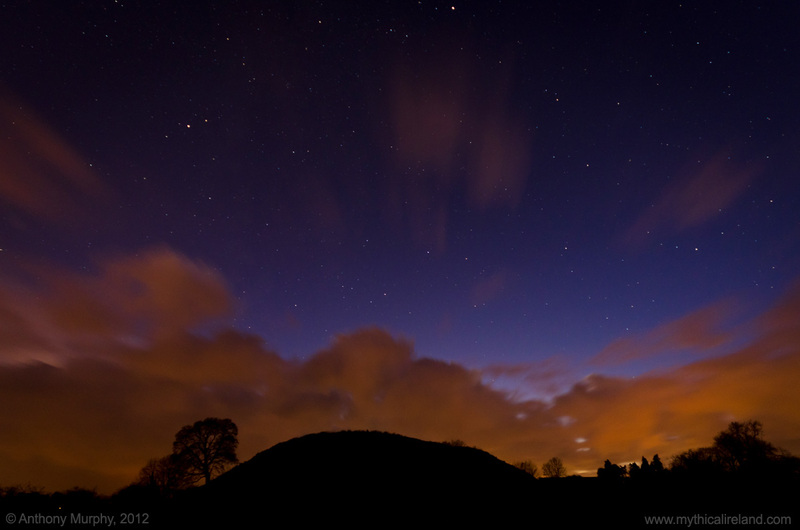 The Plough (Big Dipper, Ursa Major) can be seen over Newgrange in the third image. Stunning skies over Dowth this evening . . .
A stunning evening sky over the Neolithic passage-mound of Dowth this evening. Given that the mythology of Dowth is all about an eclipse which plunges the land into darkness, and that the name of Dowth - Dubhadh - means 'darkness', one might wonder why mankind ever grew afraid of the dark when the sky gives such glorious displays as this one. I spent around three hours this evening at Dowth, a place I deeply love. Unlike Newgrange and Knowth, it has not been excavated or reconstructed in modern times, and the tourists/visitors are few and far between, especially in the winter. I was hoping to get a photo from the top of Dowth looking at the sunset towards Newgrange. However, the sky was almost completely overcast when the sun went down. However, as night came in the clouds started to break up quite nicely, allowing the stars to shine through. 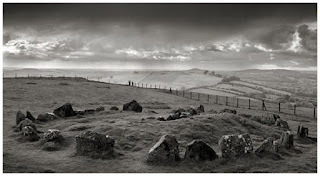 I got busy finding a location where the sky would form a dramatic backdrop to the mound. What I particularly love about this shot, and some of the others that I took, is that the clouds seem to mimic the profile of the mound and trees. The orange colour of the clouds is light pollution from the town of Navan, some 10 or 12 miles to the west. They gave a dramatic contrast to the deep blue of the sky's afterglow. The shot below was taken five minutes later. The sky was darker, but the clouds were brighter! 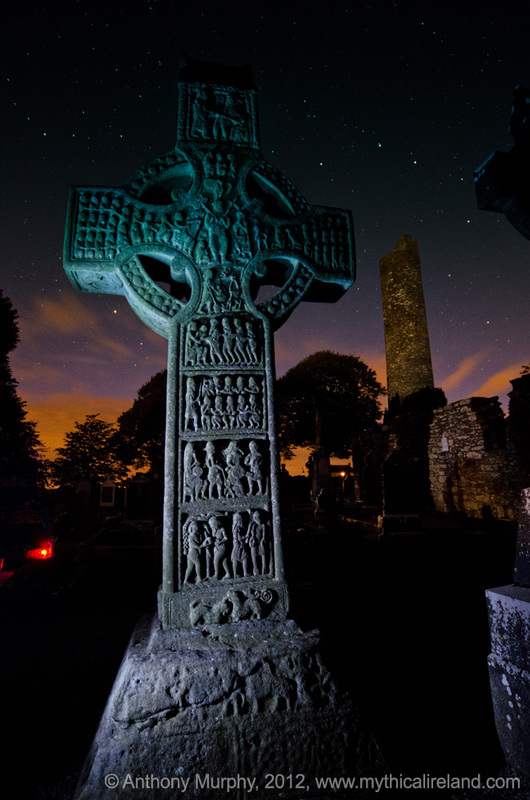 Light pollution is becoming a major problem in Ireland. This is a short video I made back in August while visiting Rathcor beach on the Cooley peninsula, said by geologists to have been the place where the builders of Newgrange sourced the granite cobble stones which are interspersed with white quartz on the front of the monument. Over 5,000 years ago, our ancestors came to this spot to carefully select water-rolled granite cobbles which can still be found scattered about this remarkable rock beach in large numbers. Archaeologists believe they transported stones to Newgrange by boat, down the Irish Sea and up the Boyne River. Rathcor is a most incredible beach. it is little visited by humans - precisely because all the stones there make it difficult to walk about, and dangerous for children. There is a sense of something untouched down there - something that has remained the same for five millennia. Ironically, the granite at Cooley is not native. 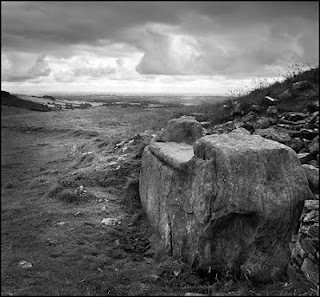 It originates further north, in the Mourne Mountains. How it got to the southern shore of the Cooley Peninsula is another question. 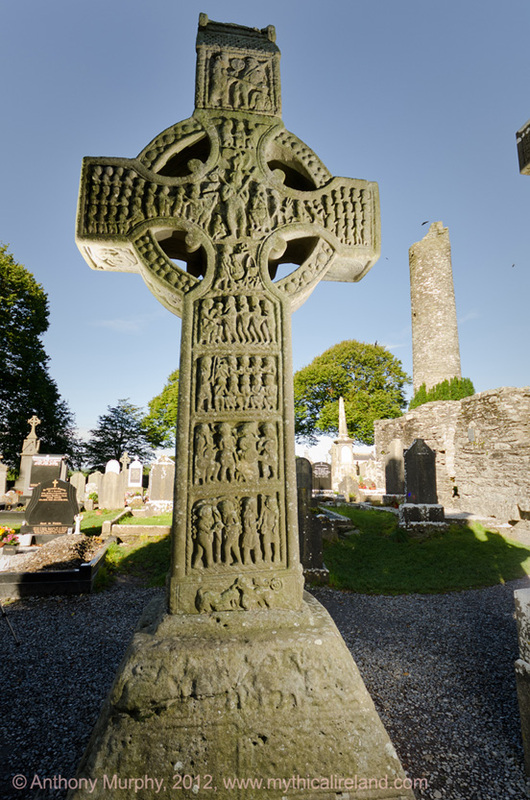 A journey to Rathcor, to see one of the sites from which the Newgrange builders got their stone, will send shivers up the spine and give you goosebumps. You can almost imagine meeting one of your ancestors there, picking up stones . . . This is the sun setting behind a hill called Réaltoge, meaning 'star, as viewed from the top of Dowth in December 2003. In the view also is Newgrange. 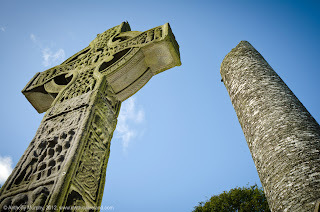 This is a video I've made featuring words from George Russell's 'A Dream of Angus Oge' (1897) set to the backdrop of my photos of Newgrange and mystical music by Matthew Florianz. 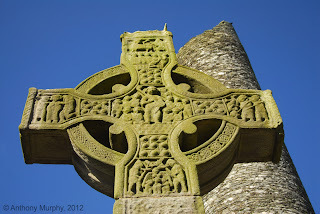 A much longer, 55-minute version of this video is available at this page on Mythical Ireland. 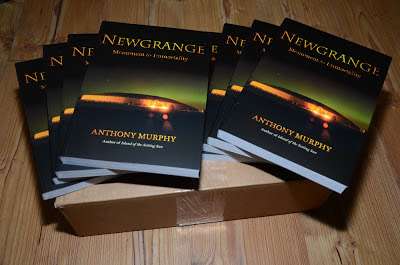 I am glad to report that my new book, Newgrange: Monument to Immortality, has arrived in Ireland and should be available in the bookshops this week. The books arrived from the printer the other day and will now filter out to all the shops from the distributor. 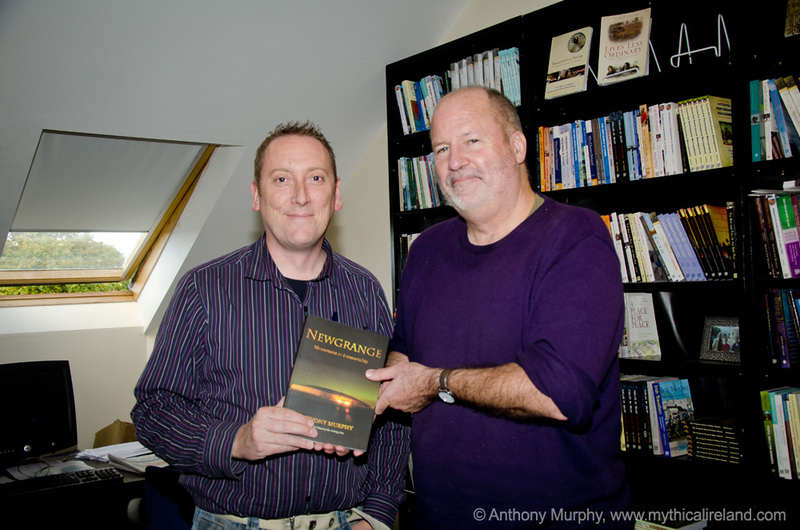 If you are unable to locate a copy in your local bookshop, please let me know by email at mythicalireland@gmail.com. Alternatively, the book can be ordered directly from the publisher, The Liffey Press, from their website or by phone at 00353 (0)1 8511458. The book will retail at €24.95 and contains 127 colour images, the majority of which were taken by me. If you enjoyed Island of the Setting Sun: In Search of Ireland's Ancient Astronomers, you will definitely enjoy Newgrange. However, my latest book is a more personal, philosophical and reflective look at our ancient heritage, and in particular what message it might have for us today, in these difficult and unprecedented times. I am delighted to report that I have just received the first copy of 'Newgrange: Monument to Immortality' from The Liffey Press. I received a call this morning to say the first two copies had been received at the publisher's office in Raheny, Dublin, from the printer. (The rest will follow next week). Monument to Immortality' in The Liffey Press offices today. It is a long-standing tradition, although not widely upheld today apparently, that the author receives the first copy of his or her work. Thankfully, The Liffey Press publisher David Givens still believes in this old mantra! And so, just after midday, myself and my wife Ann were on the M1 motorway heading for Dublin. I have to say that I felt like a child waiting to see what Santa had left . . . I couldn't wait. The book is beautifully printed and finished, and feels quite weighty in the hand. I am thrilled that so many colour photographs have been used in the book. It is a top quality production - and I wouldn't expect anything less after the tremendous job that was done with 'Island of the Setting Sun'. The book should be available in the bookshops by the end of the month, and the first official launch will take place in The Barbican, Drogheda, on Friday, November 9th. The new Newgrange book alongside Island of the Setting Sun. 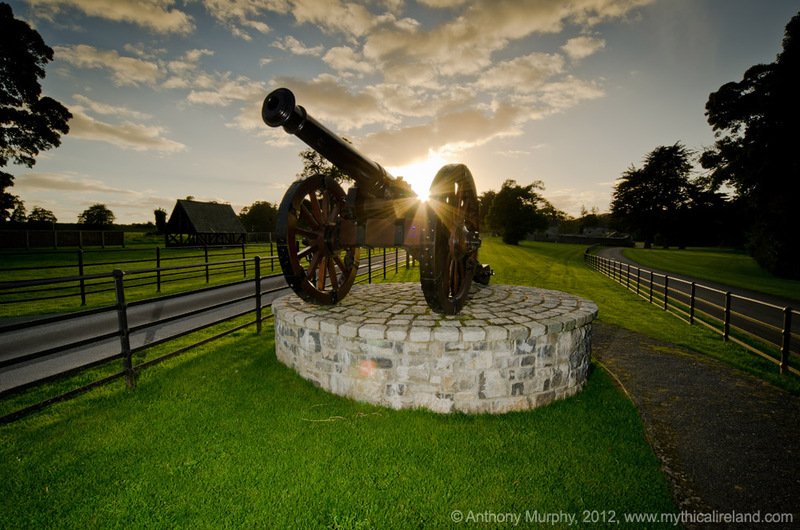 One of the replica cannons at the Oldbridge Battle of the Boyne visitor site. A riverside walk in Drogheda at Mell, along the river Boyne. 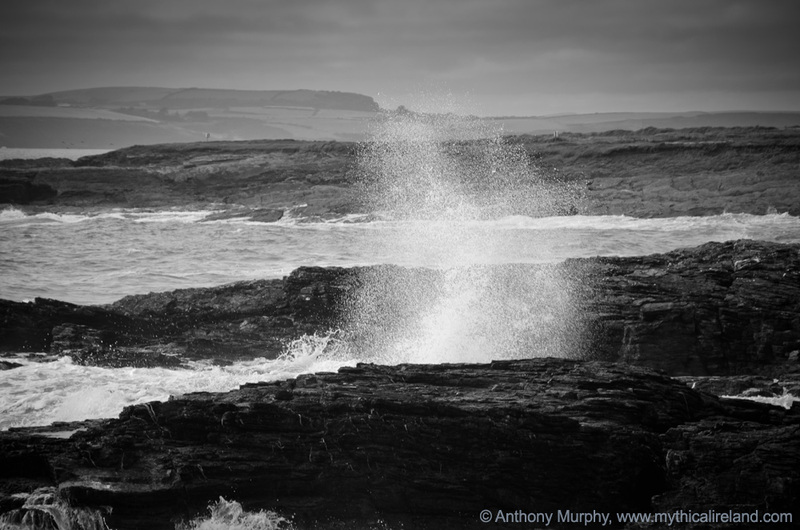 A stormy sea crashes into the rocks near Hook Head, Co. Wexford. Mr. Brian Hayes, TD, Minister of State at the Department of Public Expenditure and Reform with special responsibility for the Office of Public Works (OPW) today announced that the OPW will be running a new Art Competition for primary school children aged 10 and over, with the winning entrants being present for the Winter Solstice in the Newgrange Chamber on December 21st 2012. Speaking at Newgrange National Monument this morning the Minister said: “I am delighted to announce this new initiative, which will provide a wonderful opportunity for six lucky children, along with a parent/guardian, to enter the chamber at Newgrange on this very special morning. “I think this new competition is a unique opportunity for children to learn about our heritage and affords the privilege of attending the Solstice to a wide range of people – schoolchildren and lottery draw winners alike.” the Minister said. In addition to announcing the new children’s art competition, the Minister was at the Brú na Bóinne Visitor Centre to preside over the annual lottery draw to select the names of the people who will be allowed access to the Newgrange chamber over the winter solstice period. This year, the OPW received almost 30,000 applications, from destinations all around the world, proof of the enduring popularity of this amazing annual cultural showpiece. The 50 winning tickets were again chosen by children from three local national schools, Donore NS, Slane NS and Knockcommon NS and hailed from locations such as The United States, The Philippines, France, Germany, Belgium, The Netherlands, Sweden, Italy, England and many Counties throughout Ireland. The winning applicants will have access to the chamber on one of the days between 18 and 23 December. 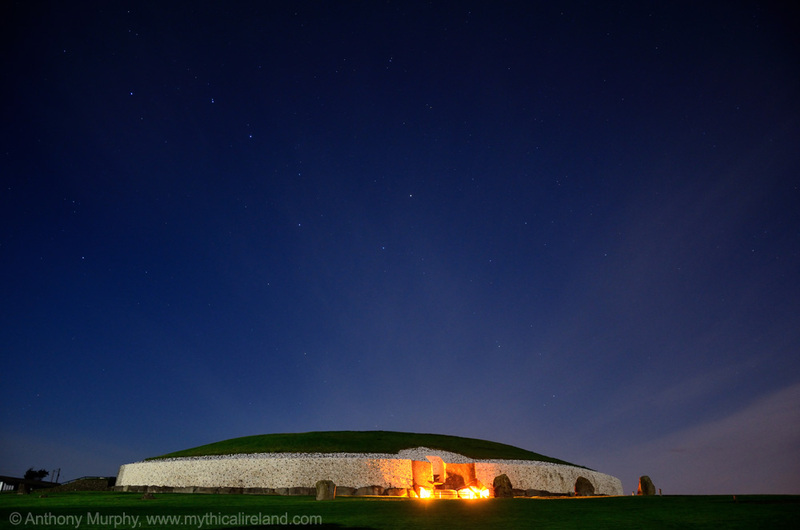 On these dates, light from the rising sun enters the Newgrange chamber and illuminates the ancient passage tomb. The winter solstice, the shortest day of the year, also marks the changing of the seasons, when days become longer and nights become shorter. It was considered by the ancients as a time of growth, a time of rebirth and, to this day, marks an important day in our calendar. 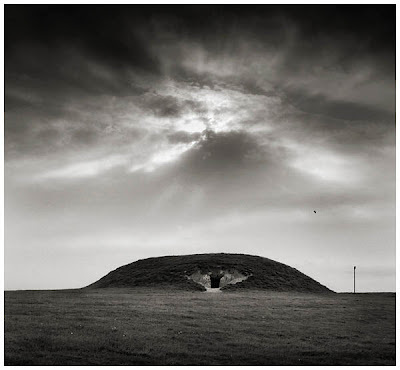 Many people who visit the ancient and magnificent Newgrange monument in the Boyne Valley are driven by some deep longing to connect with their most distant roots. The giant 5,000-year-old megalithic construction evokes awe and wonderment, and often a sense of melancholy for the community of people who created it from stone and earth in the remote past, a people now lost to time. For the past three centuries, archaeologists, antiquarians, and researchers have been probing Newgrange in the hope of revealing something about its purpose, and something about the mysterious people of the New Stone Age who created giant structures using primitive technology. In this fascinating book, Anthony Murphy shows that Newgrange is not only a uniquely special place, but that its construction was carried out not by a grizzly mob of grunting barbarians, but rather by an advanced agrarian community who had developed keen skills in the sciences of astronomy, engineering and architecture. Newgrange: Monument to Immortality goes deep into the mind and soul of our neolithic ancestors to better understand what led them to build this remarkable monument. 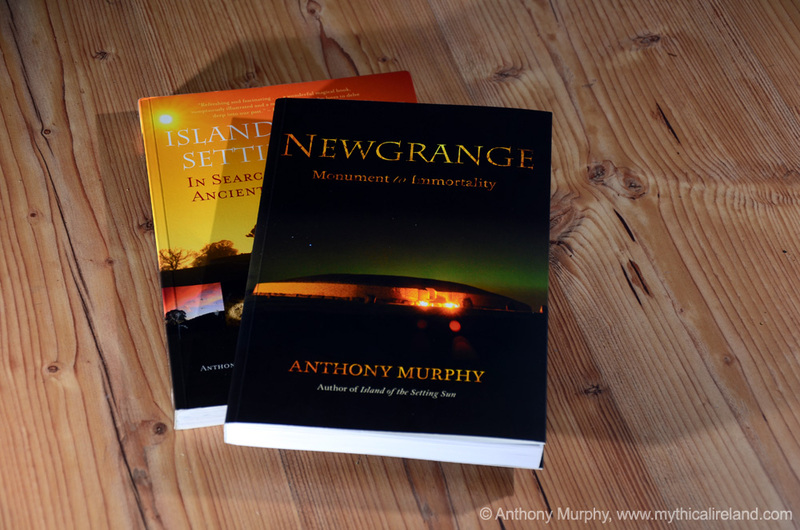 In a deeply moving, poetic and philosophical exploration, Murphy looks beyond the archaeology and the astronomy to reveal a much more profound and sacred vision of a sophisticated people who were driven to create this marvellous testament to their time. The book has gone to the printer and, all going well, should be available to purchase in late October. To pre-order your copy, visit The Liffey Press website. Muiredach's Cross at night with the round tower in the background. The three stars above the tower are the handle of the Plough. 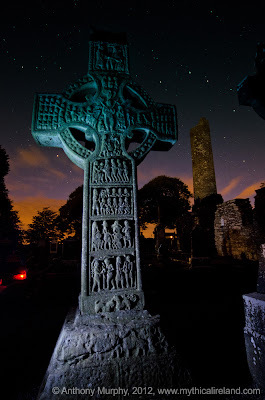 Muiredach's Cross just after dusk. 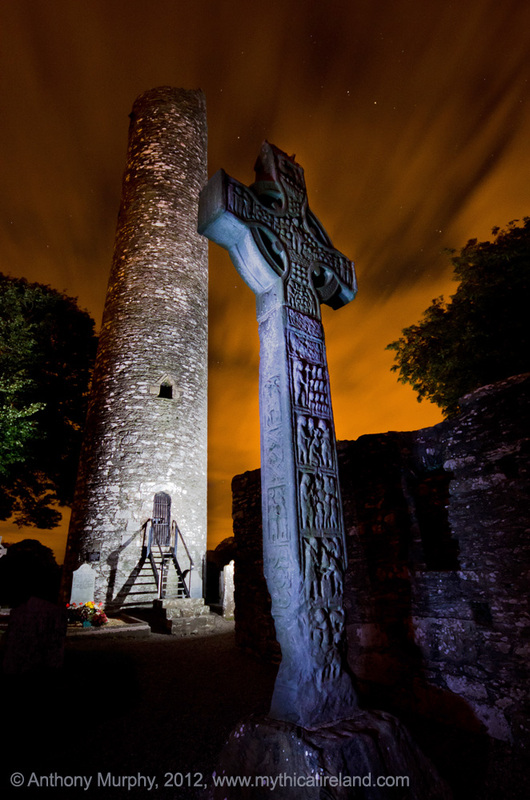 The Western Cross with an illuminated round tower. Newgrange in the evening sunset glow. Taken September 8th, 2012. 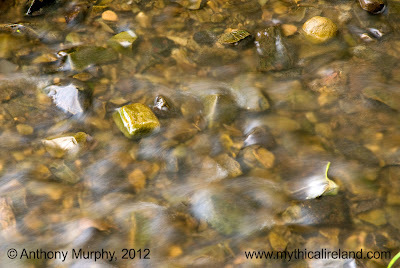 I thought I would share a couple of recently taken photos from the Boyne Valley. 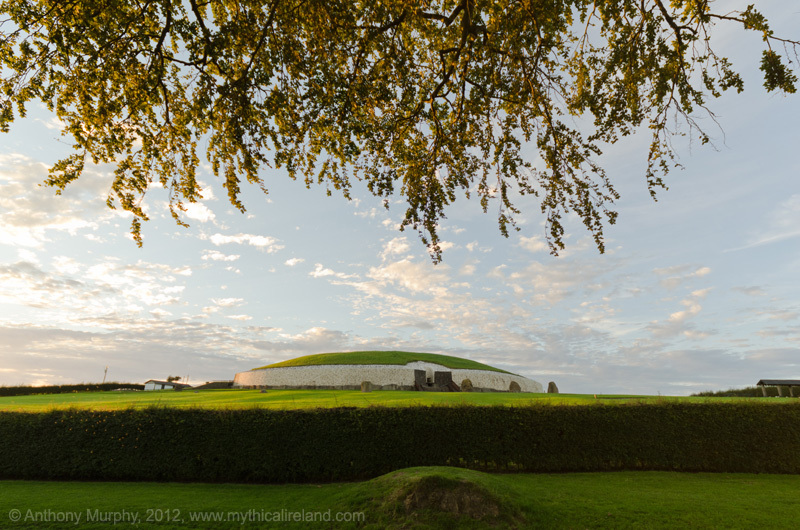 Above is Newgrange taken about 20 minutes before sunset. Below is Dowth, which is the anglicised version of its Irish name, Dubhadh. 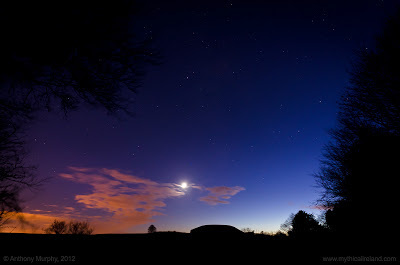 According to the legend of Dowth, which is about a total eclipse of the sun, darkness fell on the men of Erin when they were making the mound. They abandoned the task, and the king said the place would forever more be known as 'Dubhadh - Darkness'. I think the photo captures that mood nicely. Dowth - Darkness - in silhouette with the full moon. I am delighted to report that you can now pre-order 'Newgrange - Monument to Immortality' from The Liffey Press. The text of the book was completed a couple of weeks ago and I will shortly deliver the photos. All going well, the book will be published in mid October and will be launched around that time. At this stage I expect there will be a major launch in Drogheda or the Boyne Valley followed by a number of smaller launches around Ireland. There will probably be a talks tour too, and I have already tentatively agreed a couple of speaking engagements to help promote the book. 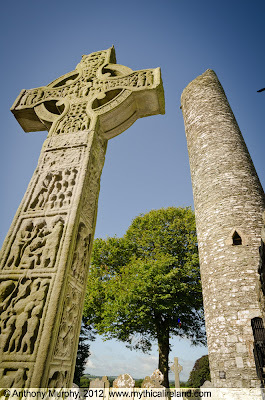 Many people who visit the ancient and magnificent Newgrange monument in the Boyne Valley are driven by some deep longing to connect with their most distant roots. The giant 5,000-year-old megalithic construction evokes awe and wonderment, and a keen sense of melancholy for the community of people who created and fashioned it from stone and earth in the remote past, a people now lost to time. For the past two centuries, archaeologists, antiquarians, writers and researchers have been probing Newgrange in the hope of revealing something about its purpose, and something about the mysterious people of the New Stone Age who created giant structures using primitive technology. 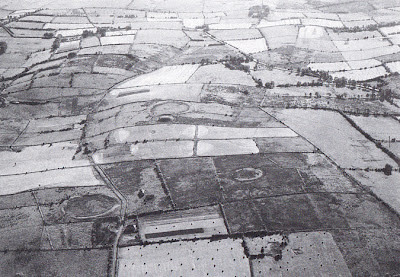 What has become clear from these investigations is that Newgrange is a uniquely special place, and that its construction was carried out not by a grizzly mob of grunting barbarians, but rather by an advanced agrarian community who had developed keen skills in the sciences of astronomy, engineering and architecture. 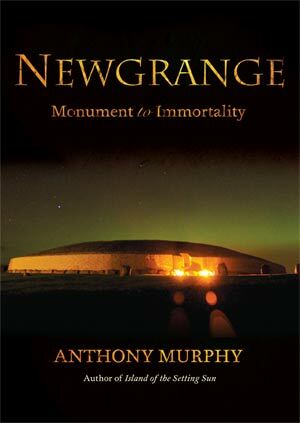 In Newgrange: Monument to Immortality, writer and researcher Anthony Murphy goes deep into the mind and soul of his neolithic ancestors to attempt to draw forth some answers to these questions. 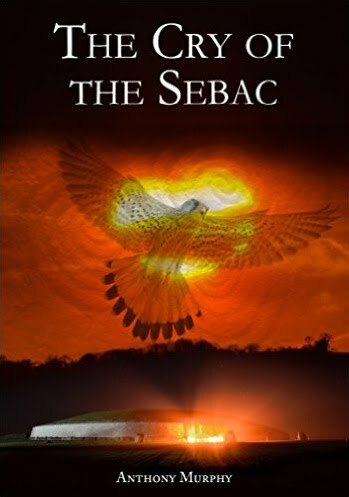 In a deeply moving, poetic and philosophical exploration, he looks beyond the archaeology and the astronomy to reveal a much more profound and sacred vision of the very spirit of the people who were driven to such marvellous and wondrous efforts. 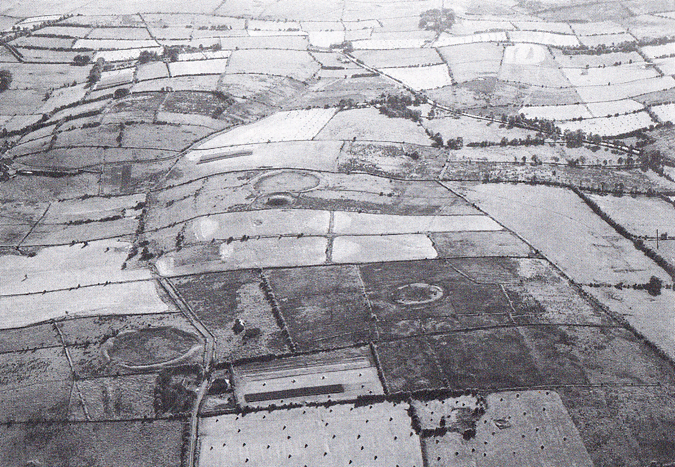 Where has this Roscommon Bronze Age landscape gone? 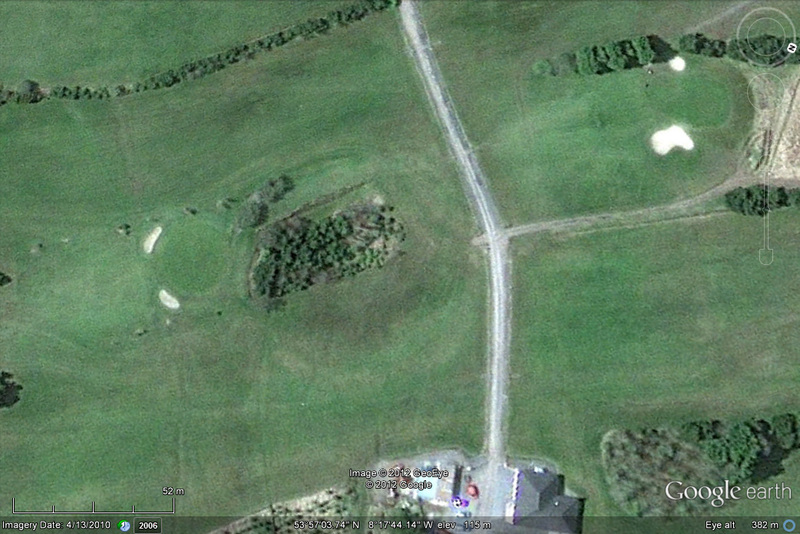 Obviously I am not armed with enough knowledge to say whether the construction of the golf club was responsible for the damage, but it is clear from comparing these photos that the two monuments visible in the foreground of the Mitchell/Ryan photo appear to have been largely obliterated in the second. I wonder do the golfers in Boyle really know when they are driving the wee white ball around the place that this landscape, not too long ago, was a fairly well preserved Bronze Age landscape dating back perhaps 4,000 years? And that some of the monuments that had survived until recently were now obliterated under the surface of their fairways? It is typical of this country, and the sort of madness that prevailed here during the decade or so of the so-called Celtic Tiger, that our most ancient treasures were sacrificed in the name of 'development', and that, ironically, this development now consists in many cases of 'ghost estates' - unfinished housing developments - and all manner of ill conceived projects which have blighted the landscape. The term 'concrete jungle' may be something of a cliche, but it applies to many places around Ireland which were once beautiful. Take, for example, the once quaint and attractive seaside village of Bettystown, County Meath, now a mass of concrete consisting of apartments, retail developments and housing estates. Knockadoobrusna, Roscommon. The outline of the enclosure can still be seen. 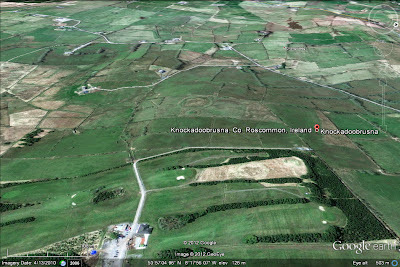 Unsurprisingly, Roscommon County Council skirts around the issue of where the Boyle monuments have gone in its County Development plan, even referring to Bronze Age barrow monuments "such as Knockadoobrusna close to Boyle Golf Course". What about the bloody sites that were destroyed???? I say unsurprisingly because, in my opinion, local authorities around Ireland in the past couple of decades have become almost completely pro-development, and at almost any price. Sure what's a few auld ringforts eh? Welcome to modern Ireland. Well, you can have your bloody stupid golf course. Frank Mitchell would, no doubt, turn in his grave. This is me at the site of three standing stones at Whitechurch, County Wexford, last week. It was really something special to see an alignment of three standing stones, which are quite obviously lined up towards Slieve Coillte, which you can see in the background of the photograph. The alignment is too far north for summer solstice sunrise, but may point towards moonrise on the major northern standstill of the moon. Further investigation will take place to determine the alignment. During the past week or so I have visited County Wexford, where I had been invited by the newly formed JFK Heritage Group to help them research ancient sites of interest around the Slieve Coillte area, not far from New Ross. Fr. Seán Ó Duinn and (third from right) Anthony Murphy. It was a very exciting week. Perhaps the big discovery of the week was the probable location of the Teampall Geal, an ancient healing centre at Whitechurch, very close to the location of a standing stone alignment of three stones which point towards Slieve Coillte. Several stones which were possibly part of this 'temple of healing' remain, in a heap under a sycamore tree at Whitechurch. They include what members of the JFK group think might be Dolerite, a blueish granite, from which the famous 'blue stones' at Stonehenge are made. These stones are said to have curative properties. The stone alignment at Whitechurch might point to the Major Northern Standstill rising position of the moon, but further observations will have to be made to determine if that is the case. The investigations took place during Heritage Week, with a public meeting on Wednesday last at the JFK Arboretum followed by a symposium on Saturday night to discuss findings and future lines of research. On Wednesday, the group was joined by Fr. 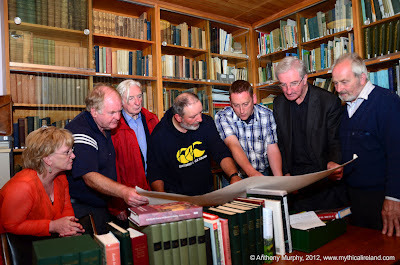 Seán Ó Duinn, of Glenstal Abbey, author of 'In Search of the Awesome Mystery'. I was delighted to meet Fr. 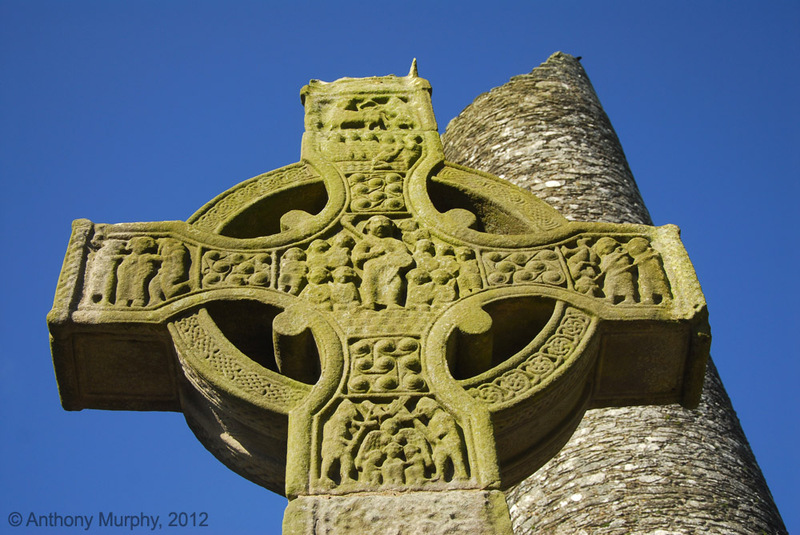 Seán, whose writings on pre-Christian and Early Christian Ireland are very insightful. The 'streak of light' you see in this picture is the International Space Station, caught in a 30-second exposure travelling from west to east from the direction of the constellation Aquila (on right of photo), through Equuleus and on towards Pegasus. Perseid meteors to rain down on earth! Celestial Fireworks This Weekend Perseid meteors to rain down on Earth over coming week Earth is beginning to make its way through a cloud of dust and debris left behind by Comet Swift-Tuttle, and already people all over Ireland have spotted extremely bright Perseid meteors caused by this dust. The meteors will appear to originate from Perseus. It is expected that on Saturday night, observers will get to see hundreds of meteors per hour. When debris enters Earth's atmosphere it lights up in the sky as meteors - also known as shooting stars - and the Perseid Meteor Shower is one of the best meteor showers of the year. 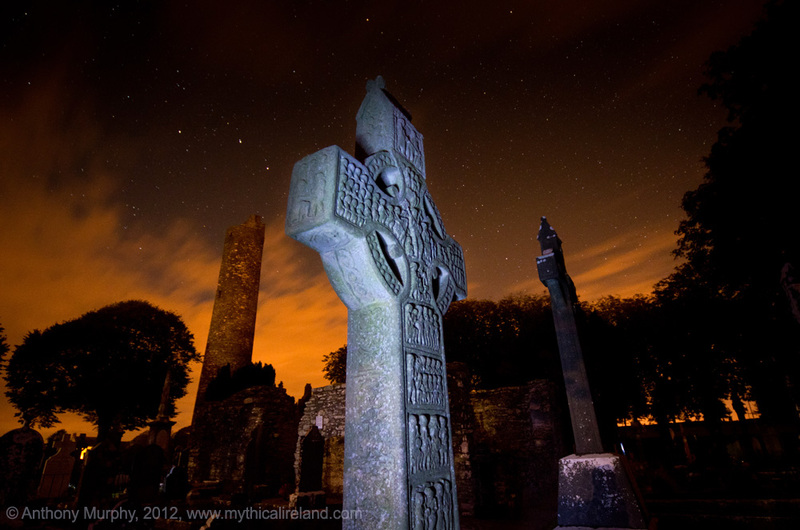 Already, Astronomy Ireland has received several reports from around the country of people spotting many bright meteors in the night sky. The best time to see the Perseids will be after midnight on Saturday night and into Monday morning (August 11th to 12th), but they can be seen at any time in the days before and after this peak once it's dark. Perseid meteors can glow very brightly, and with no Moon to cause a glare they will be easily visible. In fact, they sometimes burn so brightly that they produce fireballs! The Perseid meteors will appear to originate from the constellation Perseus in the north-eastern sky, but can be seen anywhere in the sky. No telescopes or binoculars are needed to see the Perseids as they are bright enough to be seen with the naked eye. 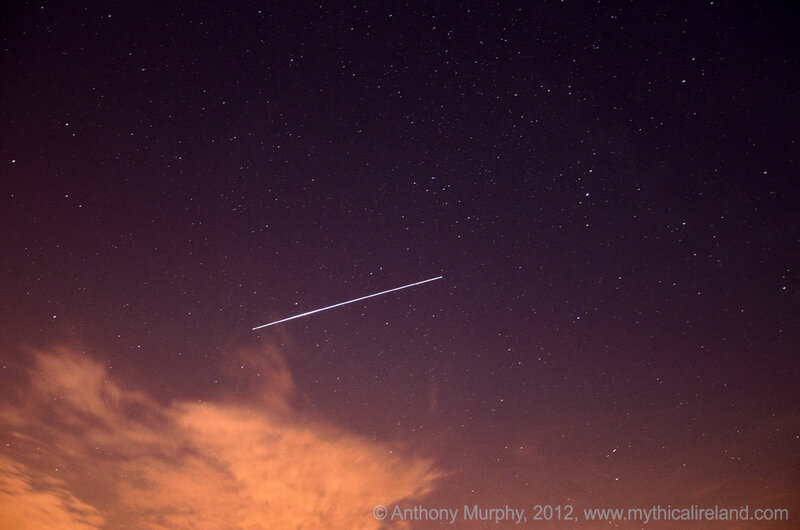 "On Tuesday night I got to see four extremely bright meteors in less than half an hour! 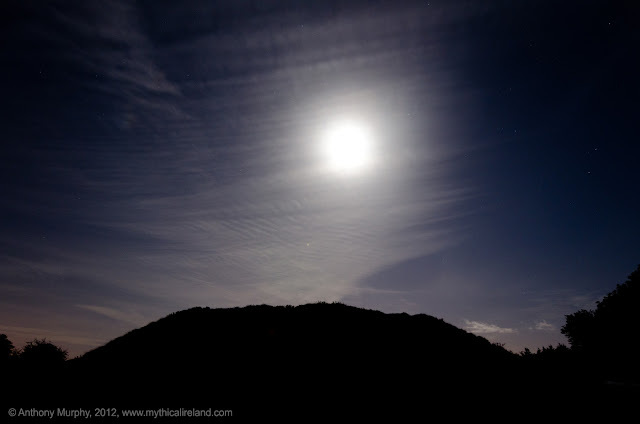 The Moon will be out of the way so it is definitely worth going outside to try to see some Perseids for what is already proving to be an excellent shower," said David Moore, Chairman of Astronomy Ireland. "Sometimes large pieces of debris enter the atmosphere and flare up extremely brightly as fireballs - these can often land on the ground! 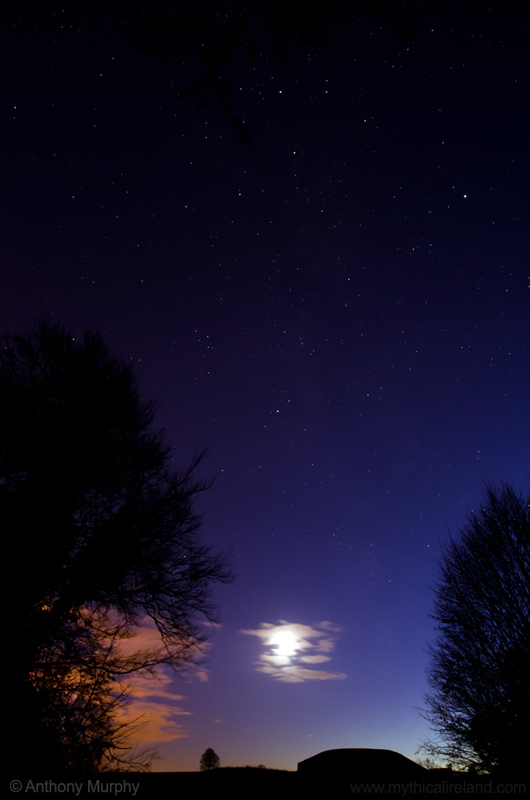 We want everyone to go outside every night over the next week and take part in our Nationwide Meteor Watch" Astronomy Ireland urges people to go outside this week and next week to observe the meteors to take part in the Nationwide Meteor Watch. By doing so, people all over Ireland can take part in real scientific research! 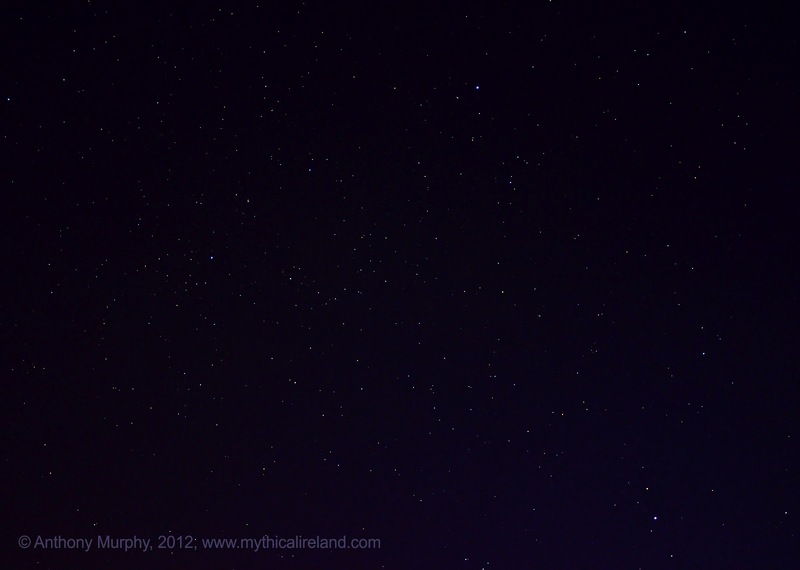 For more information on the Perseid Meteor Shower and how to take part in the Nationwide Meteor Watch please visit www.astronomy.ie. Some of these reports will then be published in Astronomy Ireland magazine in the coming months. The constellation we know today as Cygnus, meaning The Swan, was probably also known in ancient Ireland as a swan. 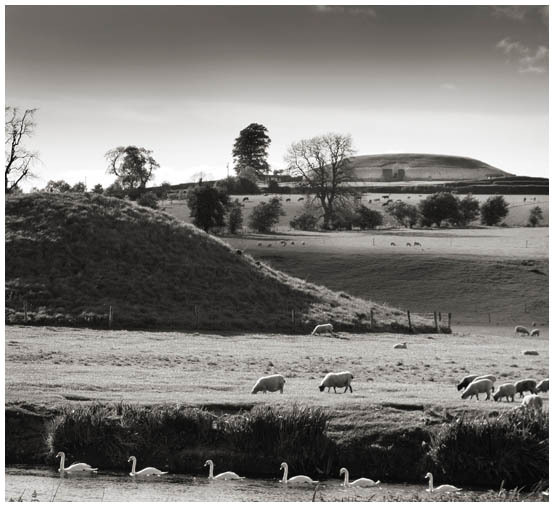 There is abundant swan mythology in Ireland's ancient lore, and there is a very strong connection to Newgrange with swans, especially the Whooper Swan which winters there. This is discussed in a chapter called The Cygnus Enigma in 'Island of the Setting Sun'. Above is a photo of the cross-shaped Cygnus with its bright star Deneb, and (above to the right), the constellation of Lyra, the Lyre, with its bright star, Vega. Tonight was my first real opportunity to use the new Nikon D7000 to take star shots, and I am absolutely enthralled and delighted with the results. 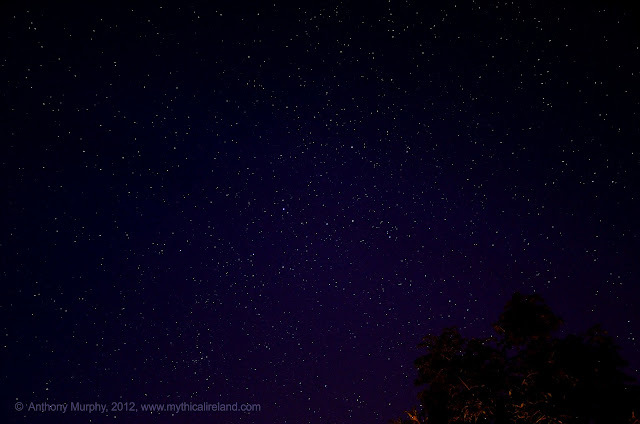 Above is a photo of the Cassiopeia area of the sky. I used a reasonably high ISO, of 1250, and an exposure of about 10 seconds. 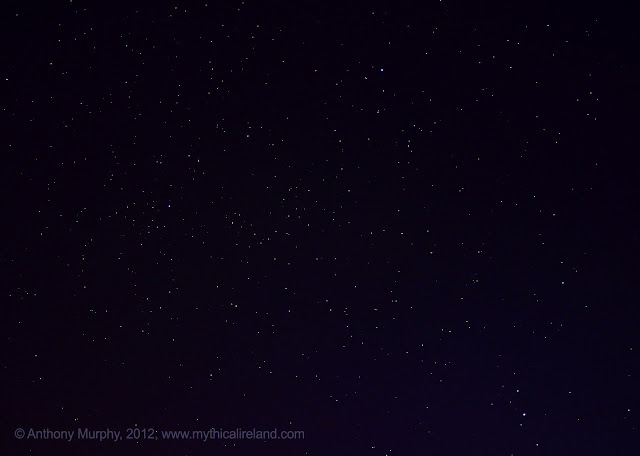 I really didn't expect to see so many stars in such a short exposure. This is amazing. I am really, really, greatly impressed. I've used the full resolution image with 90% jpeg settings so that you can appreciate what I am talking about. I know this is not entirely related to Mythical Ireland, but my Nikon D7000 will, I hope, be used to capture many nice images for the website and other projects. I wanted to share two images that I took with the camera in the past couple of days. It is a nice piece of kit. 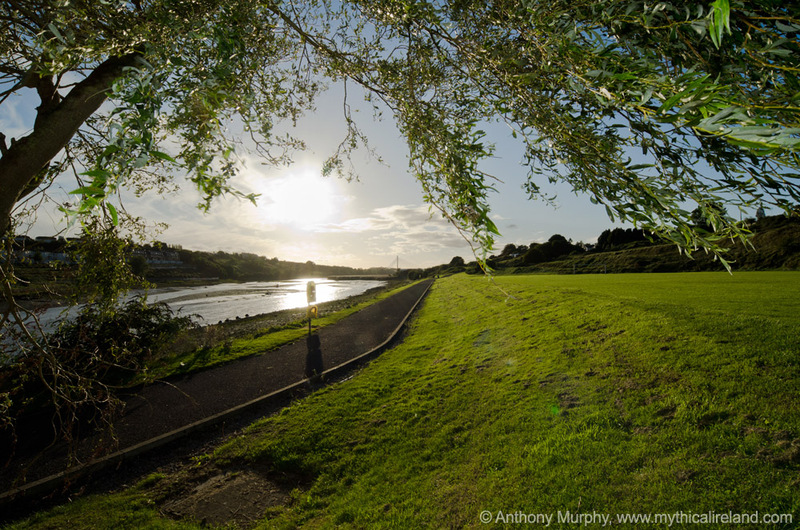 The first is a picture of some houses on the outskirts of Drogheda, overlooking the Boyne river. 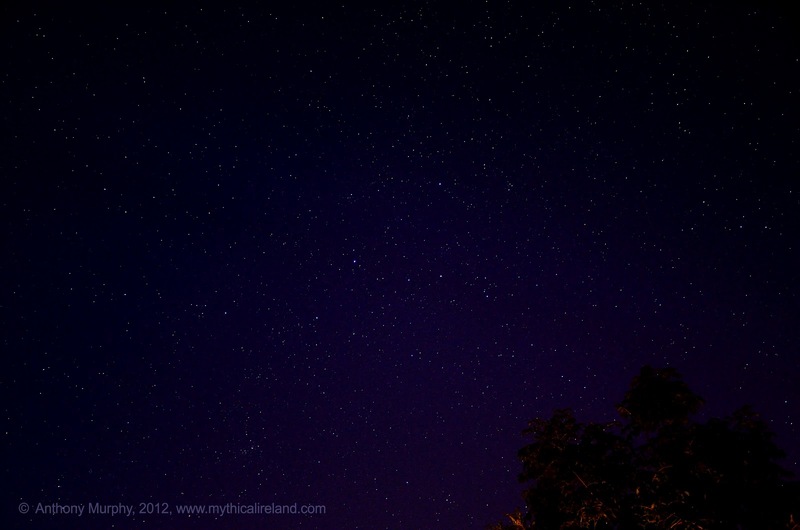 It was taken at ISO100, with an F stop of about F11, and an exposure of 30 seconds. The second is this picture of Newgrange, again at ISO100, and F11. The exposures on the D7000 seem to show better detail compared to my D200. In some pictures there is both a bright sky and a bright foreground. Impressive. water takes on a misty look. A stick and a leaf in the stream. The stream is very shallow, only inches deep. Researchers have used mathematics to conclude that ancient Irish epic, Táin Bó Cúailnge, may be more closely based on real-life societies than previously thought. by the late Louis Le Brocquy. The study takes a numerical look at how interactions between characters in the ancient Táin Bó Cúailnge compare with real social networks. Two Irish academics compared the social network structures in the story to each other, to real social networks and to fictitious societies such as in Harry Potter and Marvel comics. The study by Padraig Mac Carron and Ralph Kenna of the applied mathematics research centre at Coventry University, England was published in the European physics journal, EPL, yesterday. THE POSSIBILITY that the south Kerry coast has over the centuries been struck by long tsunami waves of over 50ft in events that have lived on in folk memory has been raised by an archaeologist. Beginish and Church Islands viewed from Valentia Island. Cross-checking folk tales with archaeological and geological evidence, Alan R Hayden, director of more than 200 medieval excavations since 1987 in Ireland, said the grouping of Valentia, Beginish and Church islands may bear the scars of earthquakes and tsunami-type waves in medieval times. 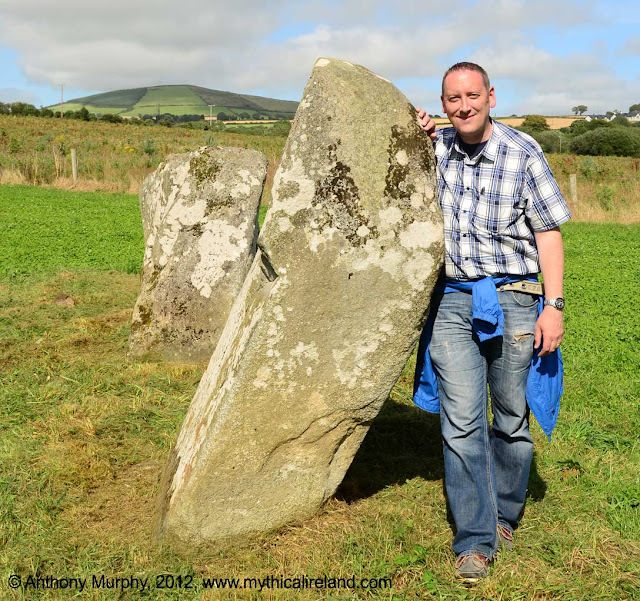 His research is reported in the current edition of the Journal of the Kerry Archaeological and Historical Society. 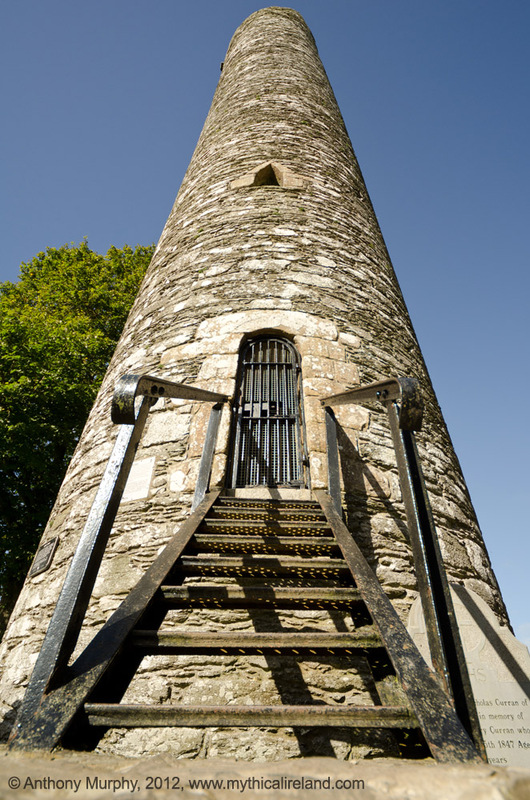 The major historical landmarks of the Boyne Valley - along with a few lesser known ones - will feature in an evocative new exhibition by accomplished local photographer Pat Burns opening next week in Drogheda. The exhibition of highly atmospheric black and white prints is the result of five years of meticulous observation and many pre-dawn forays to catch the magical early morning light. The exhibition, at the Abbey Gallery in Dominic Street, will feature rich moody images of Newgrange, the Hill of Slane, Monasterboice, Mellifont, Dunmoe Castle, Bective Abbey, Tara, Trim Castle, the cairns at Loughcrew and the standing stones at Baltray. 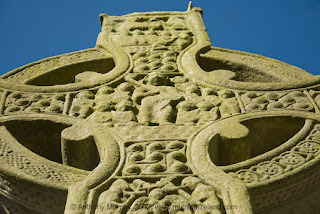 “For over 5,000 years, builders have left their mark in wonderful inscribed stone buildings and monuments across this ancient and historical countryside. It is a rich and royal landscape, home to high kings and druids, Christian saints, monks and monasteries,” says Pat, who hails from Laytown. 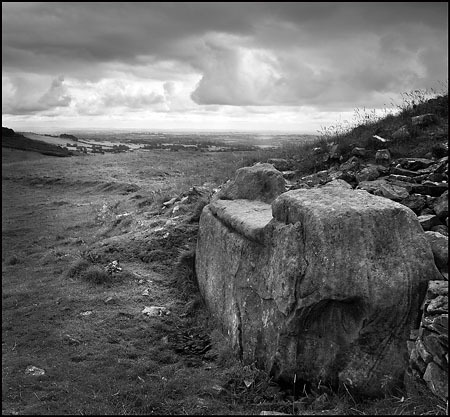 Pat is a self-taught photographer with a particular interest in documentary and landscape work. He has recorded many aspects of life and community in Laytown where he has lived for almost thirty years. 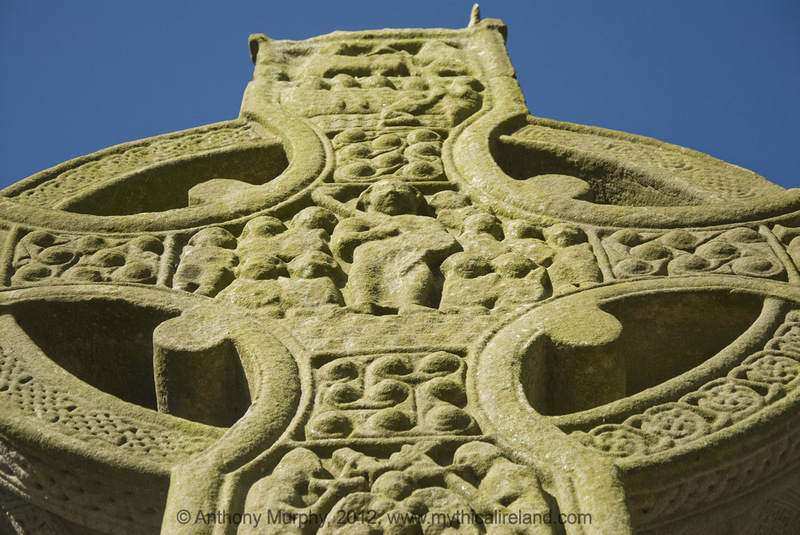 The exhibition will be opened by Anthony Murphy, co-author of Island Of The Setting Sun: In Search of Ireland's Ancient Astronomers, on Thursday July 26 at 7.30pm. Labels: Boyne Valley, Cairn T, Drogheda, exhibition, Hostages, Loughcrew, mound, Newgrange, Pat Burns, photography, Tara.